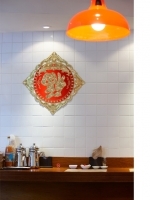 The brief asked for a combination of the hectic but welcoming atmosphere of cheap Hongkong eateries with a more traditional European shop frontage. 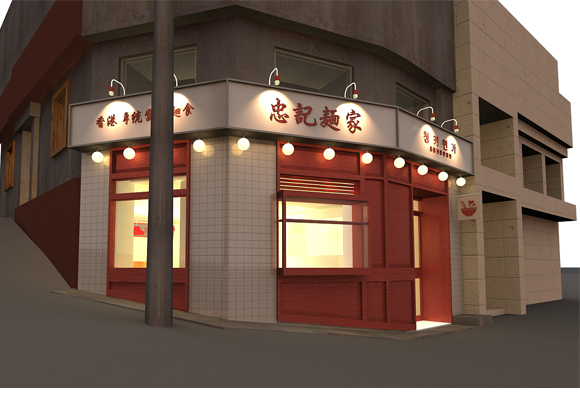 The wonton kitchen in the front of the shop pops out of the facade, with the food preparation becoming a clearly visible performance. The sign and lighting emphasise the contrast between the deep red of the panelling and the white tiles. The interior is articulated in comfortable and simple materials: timber, polished concrete and plaster, with a geometric steel pannel creating shadow plays on a warm green wall.